The English Riviera BID Company (ERBIDCO) produces a Destination Guide on an annual basis as its core piece of promotional printed literature. 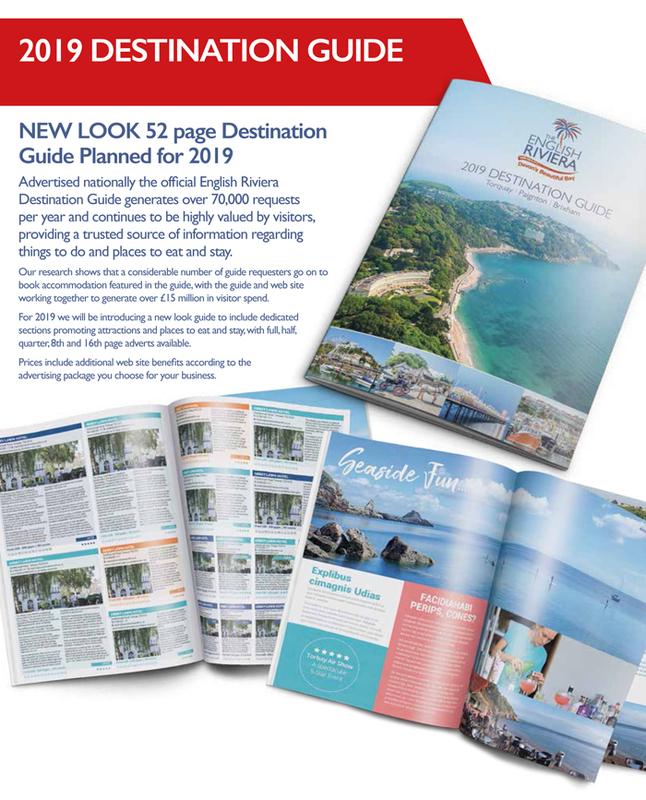 The Destination Guide is designed to not only inform visitors on all aspects of their visit to the English Riviera but also to stimulate and influence potential new visitors to choose to holiday in the resort. The annual Destination Guide is published in December each year with 100,000 copies printed and 80,000 + mailed to households across the UK on request. The ERBIDCO recently commissioned research to better understand the impact of the Destination Guide in terms of boosting booking levels as well as the economic return from the investment to produce the annual guide which total in excess of £100k to include design, print, national promotion and postal fulfilment. These costs are offset by local businesses paying to advertise in the annual guide. The latest research has been undertaken by the South West Research Company further to the research commissioned by the English Riviera Tourism Company earlier in 2014. The research data clearly shows that the English Riviera Destination Guide is highly valued and a used information source for a considerable number of both visitors and the increased return on investment since 2014 suggests continued improvement by the ERIDCO in how they reach, communicate and influence consumers to the resort. The data also shows that a considerable number of guide requesters go onto book accommodation featured in the guide. The full Marketing Evaluation report can be viewed below and the latest research highlights that the future of the English Riviera Destination Guide should be secured as long as it continues to produce results of the stature and provide the high levels of Return on Investment.